Pivotal is delivering a unified set of technologies to power digital enterprises.To learn more about our transformative combination of leading agile development services, open cloud platform and open suite of big data products, we hope you'll join us at this exciting event! Pivotal is a sponsor, presenter and exhibitor at one of the big data industry's premier events – September 29th - October 1st in New York. If you're planning to attend, be sure to visit us at booth #531 to see the latest Pivotal Big Data Suitedemos, learn more about the Federation Business Data Lake and the Open Data Platform Initiative, or just speak with our industry experts. Pivotal will also be hosting a session, entitled Business impact from IoT? Just add data science and co-sponsoring the Data After Dark: High Line Hop with our partner, EMC. 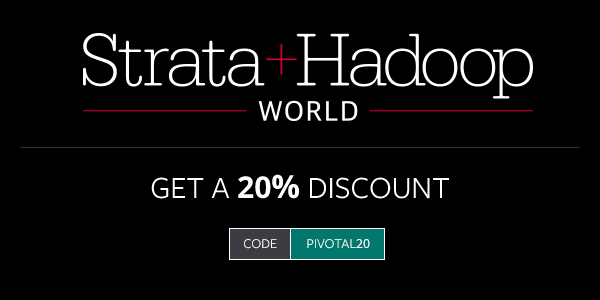 If you haven't registered yet, use Pivotal 20 to get a 20% discount on the current published price. Pivotal is a trusted partner for IT innovation, enabling enterprises to provide modern software-driven experiences for their customers and workforces. The combination of leading agile development services, an open cloud platform and open suite of big data products accelerate innovation cycles for our customers across every industry. More at pivotal.io. © 2015 Pivotal Software, Inc. All rights reserved. Published in the USA.